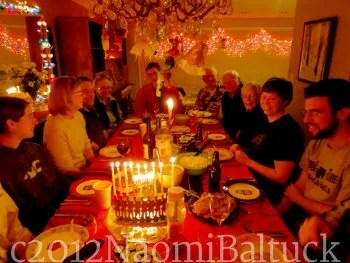 At our house we celebrate Christmas and Hanukkah, and we also give a nod toward the Solstice. This year we planned to observe the Solstice with a bonfire, and burn twenty years’ accumulation of tax receipts in our firepit, but it never stopped raining long enough to light a match. 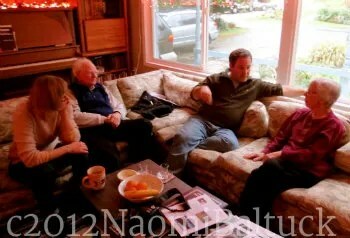 Eli and I told Christmas and Hanukkah stories at the Renton History Museum. One cannot properly tell stories without feeling the spirit within. So we were primed for both holidays. 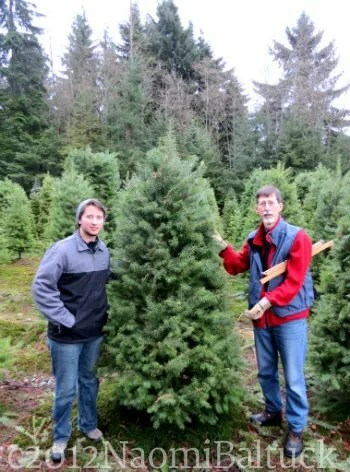 Afterwards we went to Farmer Brown’s Tree Farm to cut our own Christmas tree. 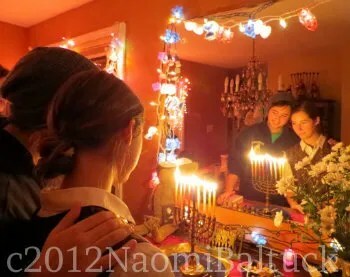 Then we went home to light the menorah. 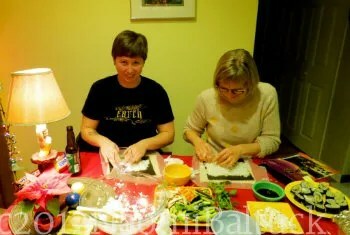 We had company this year, long lost cousins of my father, the son of Jewish immigrants from the Ukraine. 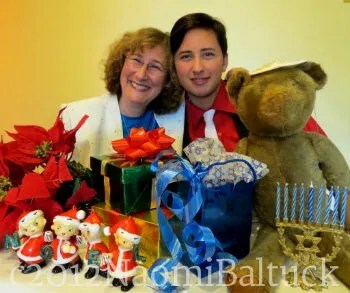 June Aptekar Allen Smith and her husband Haskell traveled to Seattle from Texas to celebrate their first Hanukkah ever. They played dreidel and sang the blessings for the first time, just as June’s ancestors had done for nearly two thousand years. 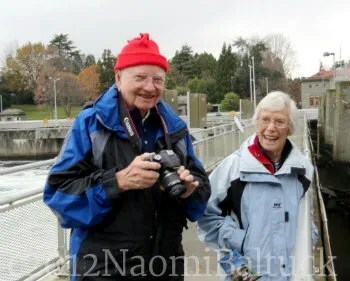 At 88 and 89, they are still fascinated by the world around them, by history, travel, current events, and the stories of strangers they meet in their every day life. We reconnected with June and her daughter ten years ago, at an Aptekar family reunion in Tucson. 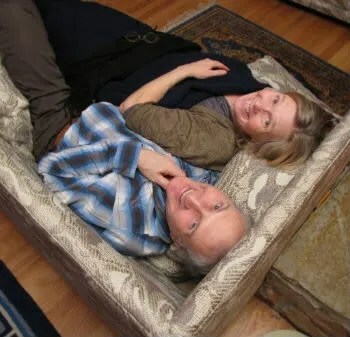 They introduced us to June’s niece Nancy and her husband Ian, who happened to live right here in Seattle, and who we now love like, well… family. During this visit, we compared notes and stories about our Aptekar roots, taking into account June and Haskell’s meticulous research, papers and letters from my mother’s attic, my Grandma Rose’s recently rediscovered autobiography among them. Cousin Bryan drove up from Portland to represent yet another branch on the Aptekar family tree. We pieced all our snatches and snippets and scraps of information into a more comprehensive family history, from before the pogrom of Odessa in 1905 to my great grandparents’ subsequent immigration through Ellis Island, and on to Detroit. In 1905, the Aptekar family huddled in the cold and the dark, listening to the screams of horses and the crash of breaking glass. 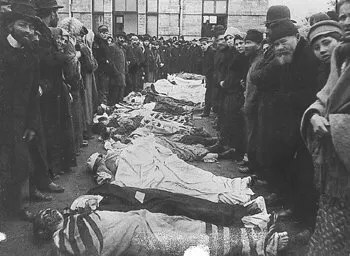 They lived on the Great Boulevard, where Cossacks charged down the street, burning the businesses and homes of Odessa Jews, killing 800 Jewish men, women and children, and causing 2, 500 casualties. Trapped inside without food or fuel for the fire, the Aptekar family huddled in their winter coats, and broke through ice in the water pail to drink. With tears streaming down his cheeks, my great grandfather Jacob Aptekar chipped tiny pieces of sugar from the sugar cone to feed to his hungry children, promising them he would find food for them soon. And promising himself he would take his family away from that hateful place forever. Jacob’s hair turned white overnight, and my Grandma Rose’s little sister Clara died in her arms. Over the next two generations, time, geography, estrangement, and self-imposed exile tugged at the threads of the Aptekar family tapestry. 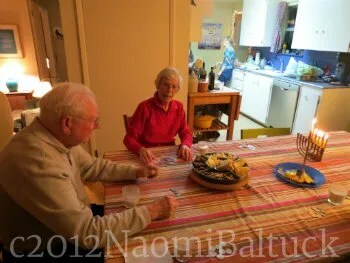 More than a hundred years later, the descendants of Jacob’s children, Reuben, Rose, and David, gathered around one table for latkes, applesauce, and Hanukkah sushi. …and it is never too late for a happy ending. All words c2012 Naomi Baltuck.